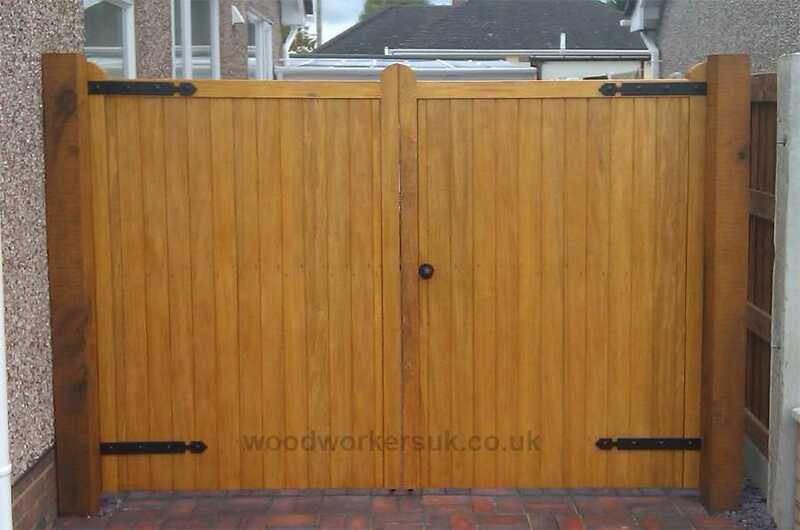 Denbigh driveway gates shown in Idigbo (Hardwood). The Denbigh driveway gates are a timeless classic. This simple, yet stunning, design would look beautiful on any driveway and add a wow factor to any home. If you want to turn your neighbours green with envy, the Denbigh gates are sure to do it. 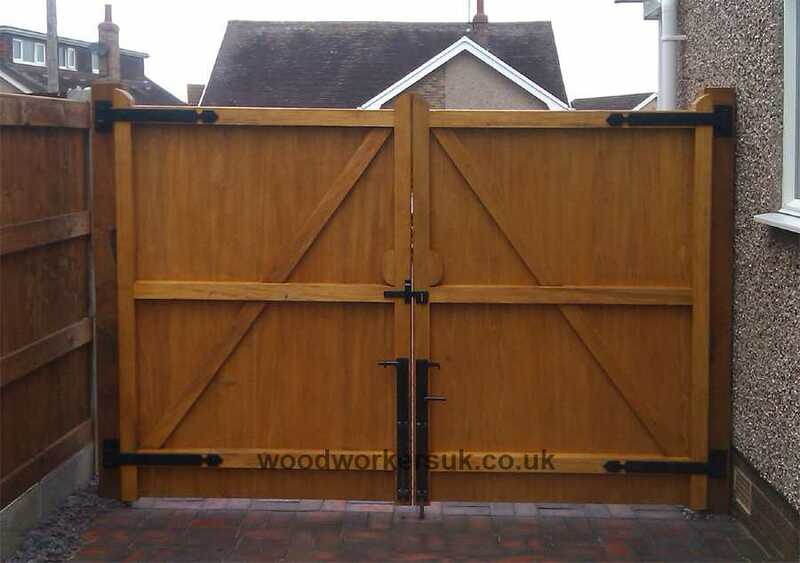 The Denbigh (Rear shown above, again in Idigbo) is our most economical gate of our standard made to measure range. These gates are made by our time served craftsmen specifically to fit your measurements. The gate is based on our tried and trusted wedged morticed and tenon solid frame and supplied either fully close boarded as shown or as an open boarded gate. Want to fit the Denbigh driveway gates into an enclosed opening? Want to get rid of the joggles (horn like protrusions) at the top of the gates? You can read more on this over on our Denbigh pedestrian gate page. We can supply our Denbigh driveway gates without the protruding joggles if you intend to fit the gates within an enclosed brickwork opening. Your existing gates in a state? Click here to get a fully personalised quote on a brand new pair! All top edges on any horizontal rails of the Denbigh feature an angled water run off, this stops the build up of moisture on your gates and makes for a longer lifespan. The stiles of the Denbigh driveway gate (vertical outer uprights of the gate frame) also have rounded outer edges. The Denbigh guide prices are based on a pair of gates 6ft high x 6ft overall wide (approx 1830mm high x 1830mm overall wide) equally split gates, these are NOT from prices, smaller gates will be more economical etc – contact us for a price! All prices are correct time of insertion and are EX VAT. Free delivery to most parts of the UK mainland is included – exclusions do apply, again please contact us. We use Unsorted Scandinavian Redwood, despite it’s name it is sorted for smaller knot size and less of them for better strength. Creamy white to yellow in colour. Used as a Mahogany substitute. Can vary in colour from a pinky red to dark red colour. A plain light brown timber which gives the Oak look but without the Oak price tag. As strong as English Oak. Also known in the trade as ‘poor mans oak’. Can be stained, however avoid painting. The most longer lasting timber on the market! Doesn’t absorb water so doesn’t rot, also as water is not absorbed then any movement within the timber is minimal! Ideal even for the most challenging environments. Timber is guaranteed for 50 years against rot and decay. Recommended ironmongery and fixings for Accoya is Marine Grade Stainless Steel. Can be painted or stained. We use Grade A1 Accoya specially sorted with few knots. Oak needs no introduction, appearance wise it is a light yellow to brown colour. We use the Prime grade of European Oak with fewer knots for unbeatable strength and maximum wow factor! Recommended fixings for Oak is Marine Grade Stainless Steel. Can be stained, as with Idigbo avoid painting. To get a personalised costing on our Denbigh driveway gates please use the form below. Alternatively you can also give us a ring on 01745 362444. Please leave us the height and width of the gates required.